Catherine M. Hansen, 87, of Meadowlark Road in the Town of Saukville died Friday, January 26, 2007 at Columbia St. Mary’s Hospital – Ozaukee Campus in Mequon. 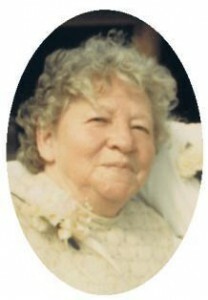 She was born in the Town of Port Washington on Middle Road on January 28, 1919 to Frank and Catherine Swatek Hansen. She married Nick J. Hansen of Denmark on August 29, 1947 in Port Washington. Throughout the years she worked at the former Wisconsin Chair Factory in Port Washington, the former Moldcraft/Heller Industries in Port Washington and Dutchland Plastics in Oostburg where she was a painter. She also worked at Krier Preserving of Belgium. What she loved the most was her employment with her husband at the Jewish Community Center of Milwaukee Day Camp in Fredonia as custodian and ‘Camp Grandma’. She will also be remembered for creating the Moldcraft ‘Black-eyed Choir Boy’. She loved to play Bingo, cook and sew. She gave family wedding gifts of feather pillows, baby blankets and quilts; playing Trouble and Yahtzee with the kids; a great sense of humor and even of few funny pranks are memories all will cherish. She was a member of St. Mary’s Church and First Congregational Church in Port Washington. She is survived by her children Jeanette Patasius of Plymouth, WI, Donald (Jeanette) Patasius of Kewaskum, WI, Ronald (Audrey) Patasius of West Bend, WI, Donna (Bruce) Laabs of Port Washington, WI, Lynda (Allen) Heider of Hingham, WI, Karla (Edgar) Harvey, Jr. of Waldo, WI and Bonnie (Mike) Erickson of Port Washington, WI. Further survived by grandchildren and great-grandchildren Debbie (Scott) Schumacher and 4 children, Lisa Haas and 2 children, Jenny Patasius and 1 child, Lori Patasius and 2 children, Jeff (Lisa) Patasius and 1 child, Randy (Toni) Patasius and 2 children, Jamie (Jenny) Patasius and 3 children, Sandy (Gary) Patasius and 1 child, Chad Patasius, Jackie Hansen, Larry (Laura) Hansen and 2 children, Leinyia (Alex) Strong and 3 children, Missy (Josh) Behm and 3 children, Nick Hansen and 3 children, Bruce (Amy) Laabs and 3 children, Love (Tom) Laabs and 2 children, Cory (Kim) Heider and 5 children, Amy (Alan) Laganowski and 2 children, Jeff Heider and 1 child, Christine Skelton and 1 child, Christian (Jenny) Harvey and 3 children, Nathan Harvey, Kate (Jack) Parrish and 2 children, Abby Harvey, Christy (Dan) Rabitoy and 3 children, Callie Erickson, five great-great grandchildren, sisters Marie (Carl) Dana of Port Washington and Ida (Jerry) Turenne of Port Washington. She is preceded by her husband Nick, son Larry Hansen, brothers John, Joseph, Frank, Leo and Lester Hansen, a sister Elrita Mielke, granddaughter Wendy Jean Harmon and 6 great grandchildren. She is further survived by nieces, nephews, other relatives and special friends. Funeral services will be held at 6:30PM Tuesday, Jan. 30, 2007 at the funeral home. The Reverend Allan Sommer of St. Mary’s Catholic Church, Port Washington will be the officiant. Interment will be in St. Mary’s Cemetery, Port Washington. Visitation will be from 4-6:30PM Tuesday at the funeral home. A memorial fund has been established in her name.